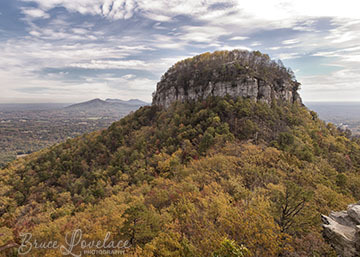 This post is about a few Charlotte NC photos I took during a recent business trip to North Carolina. I want to provide you a few random photography tips using ordinary photos. 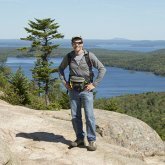 Improving your photography technique is just as important to practice with your everyday snapshots as it is with those memorable postcard or contest winning subjects. These photographs are not award winning by any means, but you can still get a few composition and lighting tips by reading this article. 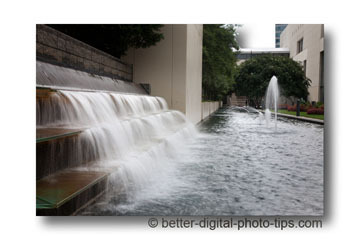 Look at this photo of a water garden outside the main entrance to the Charlotte Convention Center. The photo lighting was overcast, dull and non-directional. I used a couple of composition techniques to make it a slightly better photo. Rather than shoot straight into the waterfall steps, I set up my camera and tripod off to the side to create diagonal lines that lead our eye into the photo. I used a very small camera aperture of f-20 to give me a large depth of field. This made the need for the shutter to stay open for about 1/4 second to get the right exposure. This created a nice amount of motion blur in the waterfall with the slow shutter speed and gave us good sharpness at the close and far focusing distances. I also used the rule of thirds in photography and place the distant vertical fountain at about the 1/3 distance in my viewfinder. This photo of the Westin building in Charlotte NC was just capturing an interesting lighting situation. I had been wondering around the city on a dreary cloudy day, disappointed that I was flying out of town the next day without getting any good weather. No good opportunity to photograph any of the buildings had presented itself at dawn or dusk because of the dull photography lighting conditions. 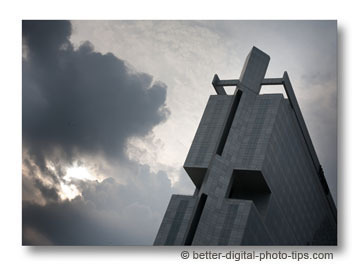 There was a slight break in the clouds as I was approaching the Westin building, near the back side of the NASCAR Hall of Fame. The clouds then became a contrasting important part of the composition. 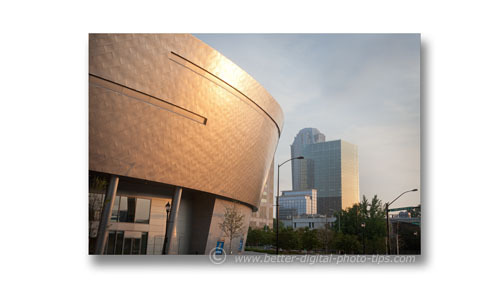 Early on the morning of my departure from Charlotte, the sun made a brief appearance as I was walking by the NASCAR Hall of Fame building for the photo below. This is a good example of how learning to See the light will help you take better digital photos. The diffused sunlight did a nice job of bringing out the round shape of the NASCAR building. Notice how the sun created a large highlight in the middle of the building which fades out on both sides of the highlight. The early morning sunlight also was good for creating "depth and dimensionality" in the building in the distance in this photograph. Similar to a Skim Light in portraiture, the light highlighted the side of the building. My Charlotte NC photos self-assignment gave me nothing for my professional portfolio, but it did give me an opportunity to share some tips on digital photography. Have any Charlotte NC photos you'd like to share? Do you have any Charlotte NC photos you'd like to share?